What do our youngest students experience at Madrona School? 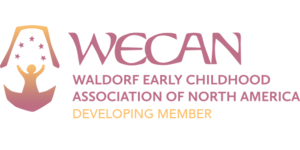 We offer parent-child classes for children and a caregiver, age 12 months (and walking) to 36 months; babies as young as eight weeks can come to our parent-infant class, as well. 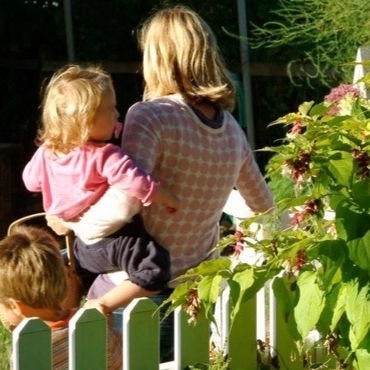 Many families came to Waldorf education through parent-child classes, and a curiousity about what this type of education might mean for their family and parenting choices. Some simply desire to spend some time in the warmth and beauty of a Waldorf early childhood classroom, and some want to make connections in a community of like-minded families. These classes offer a glimpse into the early childhood rhythms present in preschool and kindergarten when the children move into an independent school experience, where our emphasis on imaginative free play and movement both indoors and out, grows with the child's developing capacities and physical capabilities. Our once weekly parent-child classes are taught by Joleen Hollow-Bist and Susie Lockard, both long-time Madrona School teachers. The classes introduce a school setting to a toddler, as well as offering a place of calm and community for caregivers. 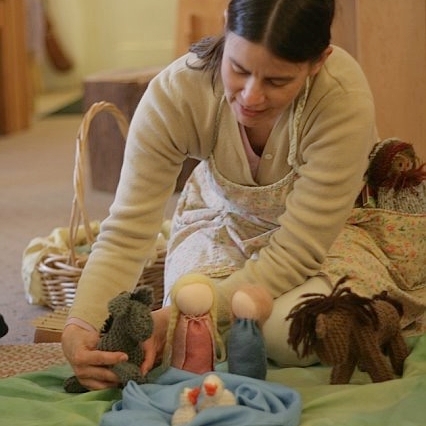 The classes offer the all important Waldorf early childhood tenet of rhythm, following the same schedule each week of free play, simple circle games, songs and story, bread baking, eating together and outdoor play. The teachers also share readings and invite conversation about parenting successes and challenges. The children have a chance to explore social interactions, they are nourished by a wholesome snack and open-ended play things, and they dig in to bread bun making and dish washing. Songs help frame different activities and offer an idea of carrying similar activities into the home. And, parents can begin to get to know one another, work on simple crafts, explore parenting topics and practice some mindful observation of the children. We also offer parent-infant classes in shorter sessions, where the emphasis is on mindful parenting and being fully and joyfully present for our children. Parents learn simple songs and lap games to take home, as well as observation exercises and ideas for simple rhythms to shape family time. New parent-child and parent-infant classes begin in the new year. If you know of anyone with babies or toddlers, please refer them to our website for more information: www.madronaschool.org/parent-child-classes or www.madronaschool.org-parent-infant-classes. Or, have them contact the school office at 206-855-8041.